Gosh, it's been a great summer! So what have I been up to since May? Well, although this is technically a "photo blog" I'm more than just a photographer. I'm also a musician, and a procrastinating ranch-hand. I spent my summer in beautiful Florissant, CO, helping my parents rid their ranch of Dwarf Mistletoe, and performing at the Midland Depot Restaurant at the Imperial Hotel in Cripple Creek. I didn't do a whole lot of photography (outside of a bit of portraiture) during that time, as I was waiting for the wildflowers to bloom. Like many of you, I'm frugal. Unlike many of you, I'm frugal because I'm financially broke, as every penny I make goes towards student loans. DON'T EVER GET STUDENT LOANS!!! So, I didn't want to spend the gas and food it would take to go around and scout. So, I spent many of my days practicing music, lumber-jacking, and working out using the P90X program. I wrote in an earlier post about how I came across a guy buried in the snow while skiing at Sierra at Tahoe, which inspired me to get into better shape. Well, I can gladly say that after 90 days of P90X I went from a skinny 6'3", undefined 170lbs to a ripped 185lbs of pure lean muscle, and my body fat went from 15% to 7%. But back to Photography. 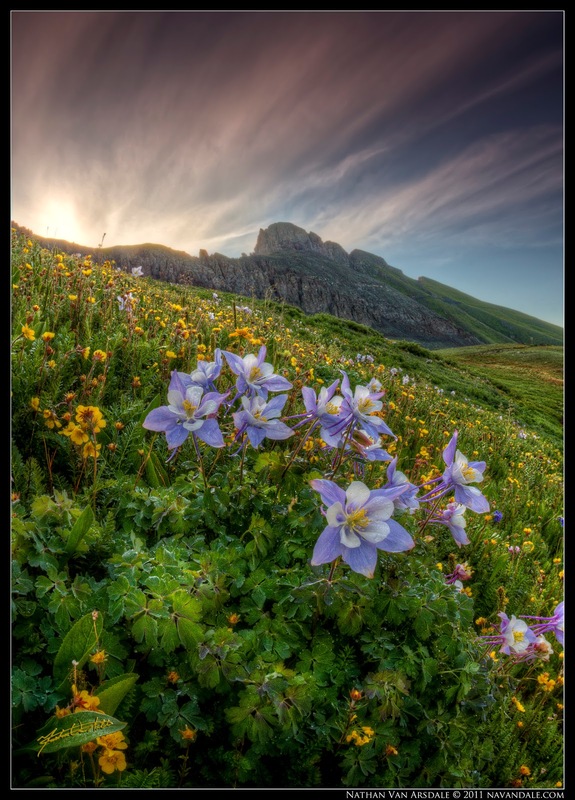 The Wildflowers finally bloomed in mid-July, and peaked towards the end of the month. Using Andy Cook's book as a guide (A Guide to Colorado's Best Photography Locations), I decided to explore the San Juan Mountains. I couldn't have been happier! 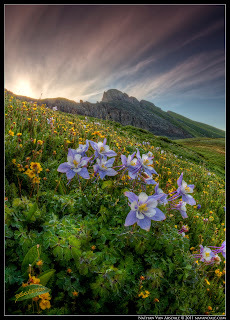 My goal was to get a sunrise or sunset image of Columbines in a field of flowers with a mountain backdrop. I got more that I could have imagined. This was the first image I posted to Flickr, which immediately got posted on Flickr's Explore. Here's a tip for photographing flowers... always bring either an umbrella, or reflector, or something to block the wind. When photographing flowers, you will notice more then ever how much they move (Especially when photographing with auto-bracketed exposures). Or, you could just count on your luck and patience... but best to be prepared, as both luck and patience tend to run out when dealing with nature. As I said earlier, I'm also a musician. And although I was singing standards and strumming my guitar at the Midland Depot, I am classically trained, and sing Opera. That being said, I have recently relocated to Las Vegas, where I'll be studying Vocal Performance at UNLV as a Master's Student. That doesn't leave me a whole lot of time to get out and photograph nature as much, but I now live very close to Zion National Park, where I am considering hosting photo-walks in the future. Here are some cool happenings too. Since I returned to Vegas, I was contacted by Coffee Break Studios, informing me that my images have inspired them to create a new screen-saver App for Macs that will track your face movements, allowing you to look around the image as though you are actually there. 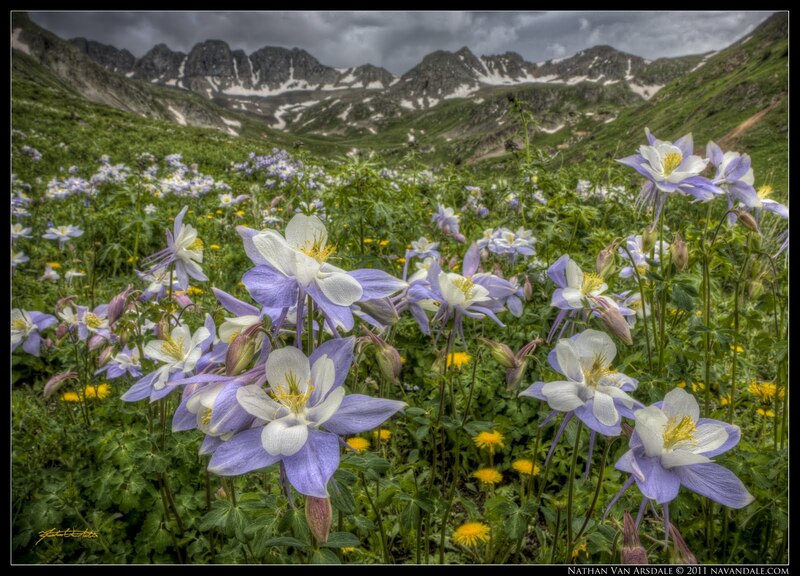 Also, if you live in Colorado, Colorado State University Extension has just created a promotional bookmark with one of my Columbine images for their website Planttalk Colorado, which focuses on horticultural advice for the state. And finally, I am being interviewed by Fine Art Photography Weekly on Sept. 13 at 1:30pm PST. Make sure you tune in to http://smibs.tv/FAPW to catch that interview. Or, just come on back to my blog afterwards where I'll have a link to the interview.